Join us at our Long Table in the garden at Deane, for a special summer version of our Winemaker's Dinner Series. The garden is at it's peak, and we are keen to take full advantage of it's bounty and beauty for our evening with Taylor. 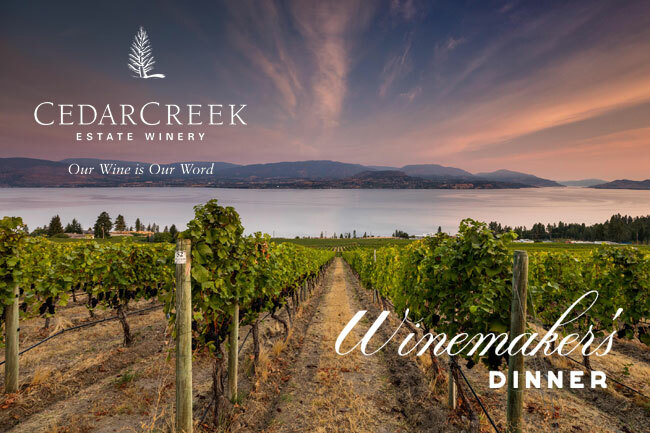 Cedar Creek is one of the "original eight" estate wineries in British Columbia, founded in 1987, at the renaissance of the Canadian wine industry. The Estate has produced some of the Okanagan Valley's best wines, and has been twice recognized as "Canada's Winery of the Year". Chief Winemaker Taylor Whelan will introduce the wines, and talk about the past and the future of their iconic vineyards. *Included in the price of the dinner is five 2.5oz glasses of wine.